A microscope image of the packed, micron-scale calcium silicate spheres developed at Rice University. Image: Multiscale Materials Laboratory/Rice University. Scientists at Rice University have developed micron-sized calcium silicate spheres that could lead to stronger and greener concrete, the world's most-used synthetic material. The researchers formed the spheres in a solution, around nanoscale seeds of a common detergent-like surfactant. The spheres can be prompted to self-assemble around the seeds to form solids that are stronger, harder, more elastic and more durable than ubiquitous Portland cement. He added that the spheres are suitable for bone-tissue engineering, insulation, ceramic and composite applications, as well as cement. The researchers report the spheres in a paper in Langmuir. 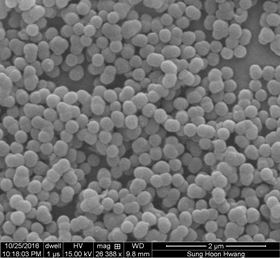 The work builds on a 2017 project by Shahsavari and Hwang to develop self-healing materials with porous, microscopic calcium silicate spheres. The new material is not porous, as a solid calcium silicate shell surrounds the surfactant seed. But like the earlier project, it was inspired by how nature coordinates interfaces between dissimilar materials, particularly in nacre (mother of pearl), the material of seashells. Nacre's strength is a result of alternating stiff inorganic and soft organic platelets. Because the spheres imitate that structure, they are considered biomimetic. The researchers discovered they could control the size of the spheres, which range from 100nm to 500nm in diameter, by manipulating the surfactants, solutions, concentrations and temperatures during manufacture. That allows the spheres to be tuned for different applications. "These are very simple but universal building blocks, two key traits of many biomaterials," Shahsavari said. "They enable advanced functionalities in synthetic materials. Previously, there were attempts to make platelet or fiber building blocks for composites, but this work uses spheres to create strong, tough and adaptable biomimetic materials. In tests, the researchers used two common surfactants – DTAB and CTAB – to make spheres and compressed their products into pellets for testing. They learned that DTAB-based pellets compacted best and were tougher, with a higher elastic modulus, than either CTAB pellets or common cement. They also showed high electrical resistance. The size and shape of particles in general have a significant effect on the mechanical properties and durability of bulk materials like concrete. "It is very beneficial to have something you can control as opposed to a material that is random by nature," Shahsavari explained. "Further, one can mix spheres with different diameters to fill the gaps between the self-assembled structures, leading to higher packing densities and thus mechanical and durability properties." Increasing the strength of cement allows manufacturers to use less concrete, decreasing not only weight but also the energy required to make it and the carbon emissions associated with cement's manufacture. Because spheres pack more efficiently than the ragged particles found in common cement, the resulting material will be more resistant to damaging ions from water and other contaminants and should require less maintenance and less-frequent replacement. Scientists have have created self-assembling molecules that can be broken down by ultraviolet light to recombine into novel macroscopic shapes.